The theme for the event this year is ‘Our Social Responsibility’ which aims to utilise football as a tool for education and awareness about issues which affect young women in Solomon Islands. The dates for the program are 11 – 12 June and the venue for the celebration in Honiara will be at the Solomon Islands Football Federation (SIFF) academy grounds. Vice chairperson for the SIFF women’s standing committee, Maria Rarawa, says that football is becoming an important sport for women and, hence, can extend its role in other areas beyond the playing field. “This year we want to take football from the pitch and into the lives of women throughout the country. We can play football but it can help us in other ways such as with health and also its power to bring people together gives us the opportunity to reach out through education and awareness talks,” Mrs. Rarawa says. For 2011, the program will span over 2 days and will include a series of talks from various non-governmental organisations and the health officers from the government and fun games for participants. This is unlike last year when the program was held for 1 day only. The first day (Saturday 11) will be marked by the official opening ceremony in the morning and will be followed immediately by football games for the young age groups organised under the Just Play program. After this another series of games for youth age groups will take place and later in the afternoon there will be several awareness talks on health and community issues. Music entertainment will also be on throughout the day. The second day (Sunday 12) will also be a full day program which starts in the morning with the Just Play competition and then the youth age competition. The afternoon will feature more awareness talks and music entertainment for the public to enjoy. The program will be open free to the public and the organising committee is calling on people to come and enjoy the event. The overall manager of the event, Diane Justus, says that women especially are encouraged to come out as the program will be interesting and entertaining. “This is an opportunity for women to come out and enjoy 2 days of football and education that is dedicated especially to them,” Ms. Justus says. Several provinces have also been preparing for the event and will be celebrating it in their provincial centres. Rennell Bellona, Western, Makira Ulawa, Isabel and Malaita are ones which have lodged submissions of their programs for the national women’s football day. Malaita was the first province other than Honiara to hold the event when it did so in 2010. More than 1000 young women came out to witness the program and teams from the northern end to the southern end of the province came to play in the organised competition. The NGOs that have confirmed their partnership for the national women’s football day are Solomon Islands Development Trust (SIDT), Sista Save and Young Women Christian Association (YWCA) in addition to the SIFF special projects office which will be represented through the LEARN&play and Just Play program. Two ministries from the government namely Ministry of Health and Ministry of Tourism have also assured organisers of their participation in the program. 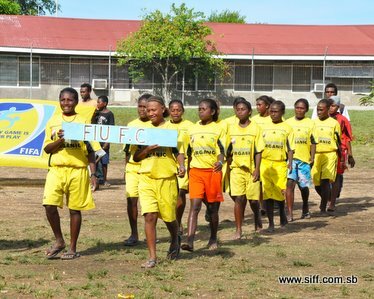 The national women’s football day concept was a resolution of the FIFA Com-Unity seminar held in June 2009 in Honiara. The seminar resolved that a day be held annually to mark the participation of women in football as a way of promoting football among the female population in Solomon Islands.